Leaders of tomorrow take charge today! 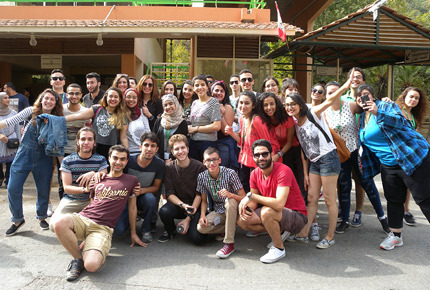 Students of LAU-MEPI Tomorrow’s Leaders program are already effecting change in their home countries. Currently, 11 different nationalities are represented in the program. Dr. Walid Touma, director of the University Enterprise Office (UEO), expects at least 5 percent of the students involved in the Tomorrow’s Leaders scholarship program (TL) his office manages to be actively effecting change in their home countries. “Now, more than ever, we are witnessing a dimensional transformation in the Arab world and the students of Tomorrow’s Leaders program are part of it,” he says. Tomorrow’s Leaders is a joint program of the U.S. Department of State’s Middle East Partnership Initiative (MEPI) and LAU. Its mission is to shape the youth with exceptional leadership potential from across the Arab world into responsible, ethical and professional leaders, enabling them to face the complexities and issues in their home countries and to bring about positive change. For Lebanese national, Abed El Karim Farroukh, who graduated with a bachelor’s degree in banking and finance in 2014, the program “was a way to receive an international education and leave my small town of Quinarite.” Farroukh explains how the experience allowed him to take part in civic engagement initiatives and to develop effective negotiation skills, problem-solving and conflict resolution abilities. A dedicated volunteer, he participated in a family planning association for Syrians in Lebanon and, during his semester in the U.S. ―as part of the curriculum―in a volunteer program for underprivileged Mexican children in Detroit. The TL alumnus highlights the dedication of the professors in the banking and finance program at LAU and the lack of hierarchy which ensured effective interaction and a dynamic learning environment. Today, Farroukh is about to start his Ph.D. in business administration and finance at the University of Washington, Seattle. Currently, 11 different nationalities are represented in the program. That it kicked-off in 2008 with only six students and is expected to reach a total of 70 plus in the coming academic year attests to its success. Jad Misri, 21, is one of the 11 Syrian students enrolled in the LAU-MEPI TL. Now in his second year as a student in TV and film directing, he arrived from Aleppo in 2013. “I came alone, and for the first year in Lebanon I worked as a security guard and slept in a church for a few months.” Thanks to the scholarship, he is now pursuing both his education and leadership development.